The John Whitmer Historical Association would like to cordially invite you to attend the 2011 Restoration Studies Symposium / Sunstone Midwest, this Friday and Saturday, April 15-16, at Graceland University Independence Campus, 1401 W. Truman Rd., Independence, Missouri. The registration table will open at 5:00 pm Friday, and the Wallace B. Smith Lecture will begin at 7:00 pm. Saturday sessions begin at 8:00 am. 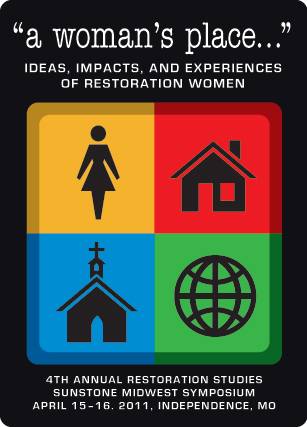 The 2011 Wallace B. Smith Lecture will be “A Woman’s Place”, presented by Gail E. Mengel, retired Community of Christ apostle and former president of Church Women United. You can view the complete program here. Walk-ins are very welcome — try to arrive by 6:30 Friday in order to ensure enough time to register. You can also register as a walk-in on Saturday. Hope to see you there!